Do you have what it takes to be President of the DeGroote Accounting Association? This is an opportunity for you to apply the management skills you have learned throughout your time at the DeGroote School of Business and to give back to your school community! Nominations for President are now being accepted for the 2018-2019 academic terms. Click the links below for more information. Nomination forms will be accepted until Monday, February 19th 2018 at 11:59 p.m. No late submissions will be accepted. Details regarding the campaigning and election process will be made available shortly, subject to MSU approval. 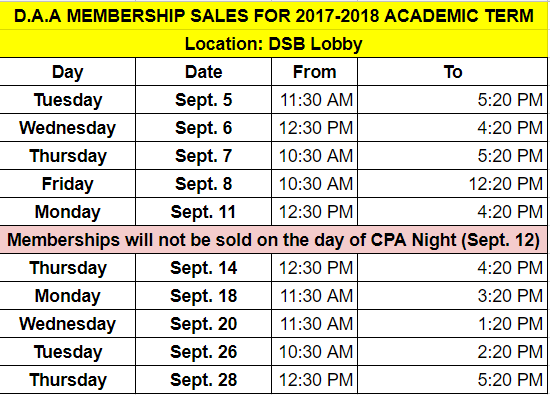 The AGM will be held on September 19 from 5:00 p.m. – 6:30 p.m. at the Commerce Lounge in DSB. Internships: (Years 1, 2, & 3): 4:00 P.M. - 5:00 P.M.
Graduate Recruitment: (Year 4+ & MBA): 5:15 P.M. - 6:30 P.M. Applications for the 2017-2018 executive team are now live! Applications are to be submitted to info@degrooteaccounting.com by Wednesday, March 08, 2017 at 5:00 P.M. No late applications will be considered. Nominations for President are now being accepted for the 2017-2018 academic terms. Click the links below for more information. Nomination forms will be accepted until Sunday, February 12 at 11:59 p.m. No late submissions will be accepted.